According to a latest market report, the conventional passenger car in 2016 in China hit 22.50 million cars and by 2017 the number is expected to have reached 23.80 million with an increase of 5.8% year by year. The Chinese market was mainly under the control of joint ventures before 2016, however, after 2016 the sales of domestic automobile brands rose annually when Chinese automakers improved their production quality. The passenger car market is expected to be much bigger with more and more emerging cities showing up. Besides, as for new energy passenger car market, concerning aesthetic design and energy saving, automotive LED lights market share is increasing, which has attracted much market attention. High /Low Beam LED headlamps- Despite high prices, major international automotive lighting manufacturers are focusing on the development of mid/low range LED headlamps in China to not only meet the demand of local market but to reduce the development and production cost. However, currently in China, most LED headlamp applications can only be seen in the high- and mid-range car market. Compared with the average LED penetration rate of 12% in the global LED headlamp market, that in China is only 2% in 2017. DRL (daylight driving light)- Since the daytime running lamp has not been standard equipment in China, many installed on mid-range cars work as position lamps and they do not usually perform as well as their equivalents in Europe in terms of lighting performance and other specifications. Yet daytime running lamps are often found on mid-range cars in China. The application of daytime LED running lamps in China reaches a penetration rate of 40%. compared with the average in the global market is 24%. Fog- As front fog lamps work for a certain purpose and need to provide a sharp lighting, their thermal and optical designs are the second hardest following those of high and low beam lamps. Therefore, the LED penetration rate in the front fog lamp market in 2017 only marks a percentage of 7%. compared with the average in the global market is 16%. Concerning electric vehicles (EV), most of their tail lights have been designed in the same lighting effect. To achieve aesthetic visual effects, more and more LED lights are necessary. Thus, car LED light penetration rate in EVs tail light market has been higher than that in general gas vehicle. Take the year 2017 as an example, car LED light penetration rate in EV tail light segment reached 75% while that in conventional passenger vehicles came to 44%. High / Low beam head lamp as the major vehicle lights requires LED power to reach about 15 watts, or requires a 40~60-watt conventional halogen lamp. The difference of light source energy consumption between the two types is huge from the way of EVs. So, EV industry fastens its adoption of LED high/low beam, and LED penetration in high/low beam segment will rapidly grow in short time. LED penetration rate in high/low beam led head lamp share arrives at 8% while that rate only approaches 2% in the conventional vehicle segment in China in 2017. The largest joint-venture automotive lamp manufacturer is Shanghai Koito, which is the joint venture between Japan Koito and Huayu Automotive Systems. Shanghai Koito has a revenue of more than RMB 10 billion. Xingyu is the largest local automotive lamp manufacturer with the revenue of RMB 2.5 billion in 2015. 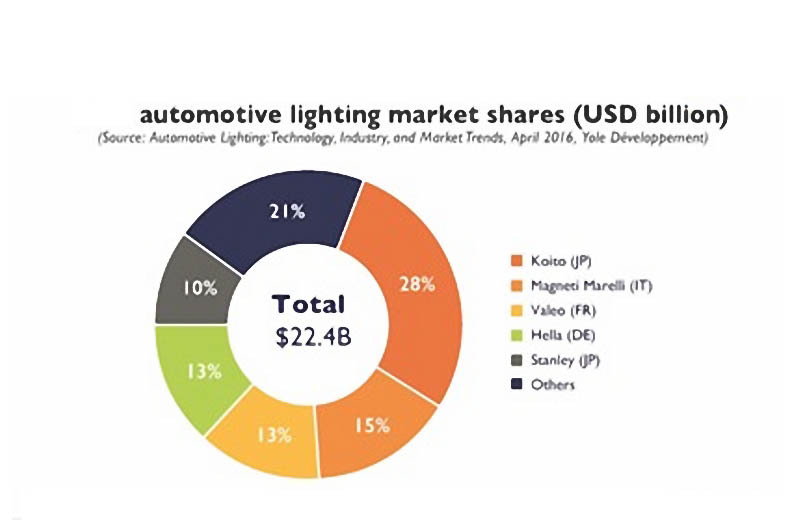 Also, the main joint venture and foreign automotive lamp manufacturers in Chinese market also cover Hella, Koito, Valeo, Magneti Marelli and Varroc TYC. The local OE lamp manufacturers include Jiangsu Tong Ming, Jiangsu Wenguang, Zhejiang Jiali, Zhejiang Tianchong, Forda Signal, Ludebei and Liaowang. Chinese auto lamp module brands (Sunlight and Laster) are famous with high visibility and universality. Most foreign-funded and joint-venture vehicle lights producers cover module business. Xingyu and Tong Ming are the few Chinese manufacturers extending the business scope to module. However, as the entry barrier of module production is not high, many other Chinese lamps companies also plan to invest on the module production line. It is anticipated that the percentage of Chinese auto lamp manufacturers with self-production module will increase greatly in the future.